Volunteer opportunities are available through the Debbie-Rand Memorial Service League, Inc.
What is the purpose of the League? The purpose of the League is to coordinate all volunteer services, to raise funds and to initiate beneficial activities in support of the not-for-profit Boca Raton Regional Hospital. Each year hundreds of people serve as Debbie-Rand Memorial Service League volunteers, meeting the needs of patients, their families and the staff at Boca Raton Regional Hospital. Our volunteers are an integral part of the hospital: acting as hospital ambassadors to patients, employees and visitors; assisting patients and staff on a nursing unit; raising funds for equipment and services; serving on an event planning committee; helping with our Pet Therapy program; delivering flowers and so much more. They include high school and college students, adults and retirees and even former patients. 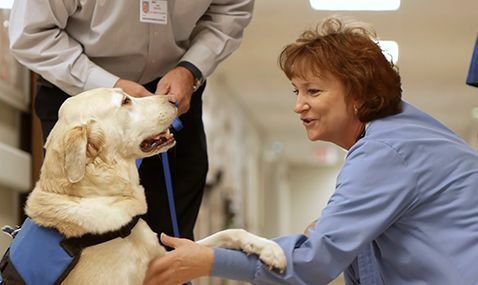 They play valuable and meaningful roles in the lives of our patients throughout our hospital. If you are interested in volunteering at Boca Raton Regional Hospital, please call the Debbie-Rand Memorial Service League office at 561-955-4098. No special skills are required. You bring a compassionate heart and we will take care of any training! ALL Volunteers are expected to contribute at least one, four-hour shift of service per week for a minimum of six months. In accordance with the recommendations set forth by the Centers for Disease Control (CDC), flu vaccinations are mandatory for ALL volunteers. Please bring proof of a recent flu vaccination to the orientation during flu season (October 1 – April 1). The Teenage Volunteers (TAV), program is open to high school students, age 15-17. For Teenage Volunteers: Click here for the application process. When you complete the online application, you will be prompted to sign-up for an upcoming orientation. Should you need to re-schedule your orientation date, please call the Auxiliary Office at: 561-955-4098. The orientation is a group session which is generally held the second Tuesday of each month at 9:00 a.m. in the Boca Regional Education Center. The Education Center is a free standing building located at the west side entrance to the hospital near the Emergency Department. Please bring a photocopy of your driver's license (or other photo identification) and your social security number. Orientation attendance does not guarantee acceptance or placement into the D-RMSL volunteer program. Following the orientation, we will call you to schedule an interview. At that time we will discuss your interests and availability to volunteer. You will also be asked for $35.00 paid by check or cash. This covers your annual membership dues ($10.00) and uniform ($25.00). Annual dues for adult members are $10; Life membership is $250. Volunteers are required to purchase ($25) and wear uniforms. Volunteers wear royal blue jackets with white, tan or beige pants. How did the League begin? On April 21, 1962, two children, Debra Ann and James Randall Drummond, were poisoned. They were rushed to the nearest hospital in Boynton Beach, but it was too late to save them. Many residents believed that had there been a hospital in Boca Raton, these children might have lived. Boca Raton’s small community of 10, 000 rallied behind Robert and Gloria Drummond and sent money instead of flowers in hopes of building a hospital in Boca Raton. The money poured in and on August 30, 1962, eighteen women met to organize what is now the Debbie-Rand Memorial Service League, Inc. Their mission was to raise the funds needed to build Boca Raton’s first hospital. The Boca Regional opened its doors on July 17, 1967 as a 104 bed acute care facility. Since the opening of the hospital in 1967 auxilians have played an integral part in its development and growth. League members have contributed over 6.2 million hours of service and over $25 million in its support.